is proud to introduce the next generation of the rough terrain crane with the new 75-ton (70-mt) 75RT. 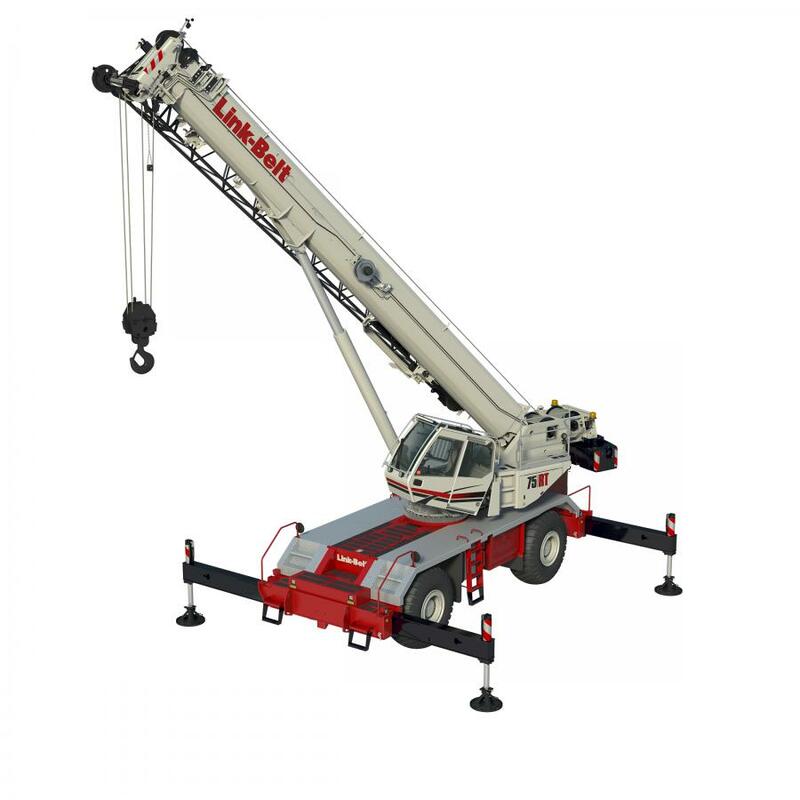 Link-Belt rough terrain cranes have been a proven performer among fleet and crane rental houses since initial introduction nearly 45 years ago. The 75RT impresses both on the road and off. It has outstanding reach for its tonnage class and a new operator’s cab has elevated the experience of owning and operating a Link-Belt crane. It transports fully loaded with counterweight under 100,000 lbs. – and under 90,000 lbs. without counterweight. A six-speed transmission on the 75RT is powered by a Cummins Tier 4F QSB 6.7 270 hp (201 kW) diesel engine. The 75RT’s five-section 38 – 142 ft. (11.5 – 43.3 m) full-power formed boom is built to Link-Belt’s own specific boom profile and tolerance in Link-Belt’s formed boom production facility in Lexington, KY. To simplify the process of lifting, only two extend modes are offered: EM1 and EM2. For greater flexibility and efficiency to customers, a two-piece [35 – 58 ft. (10.7 – 17.7 m)] and three-piece bi-folding fly [10 – 35 – 58 ft. (3.0 – 10.7 – 17.7 m)] are both available, for a tip height of 208.7 ft. (63.6 m). The matching main and auxiliary winches have 18,603 lbs. (82.8 kN) of maximum line pull and a maximum winch speed of 485 fpm (147.8 m/min). 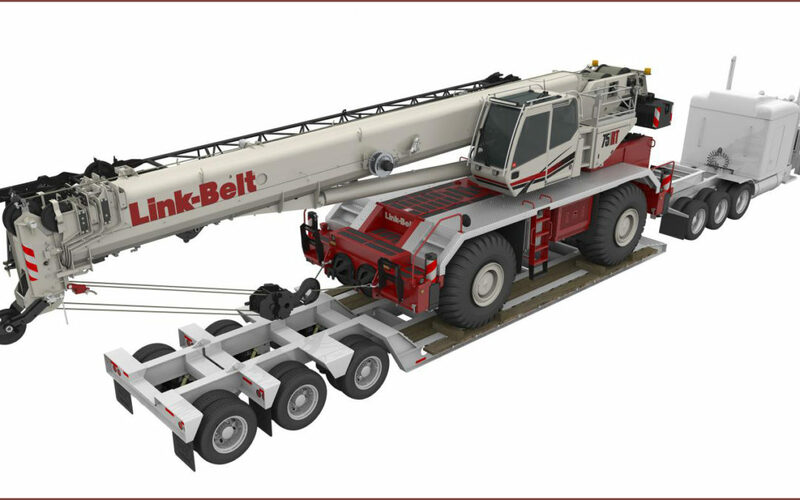 Pulse 2.0 is Link-Belt’s next evolution of its patented crane operating system. In addition to the intuitive design for the operator which includes a larger 10 in. screen and has also added programmable features for greater customization, Link-Belt Pulse 2.0 can be updated and serviced remotely. The system includes a Wi-Fi hub and uses the serial number of the unit to determine whether any updates are available, and download/installs to the appropriate controls. Software maintenance can be accomplished in the field without a service call or bringing a crane in for service. The 75RT will be the first Link-Belt crane model to showcase V-CALC or Variable Confined Area Lifting Capacities. This new feature provides more selectable outrigger configurations by allowing outrigger beams (either fully retracted, intermediate or fully extended) to be setup in pairs either from side-to-side or front-to-rear. Once outriggers are set, the Pulse 2.0 system provides an outrigger configuration which provides different previews representing workable areas, indicating a percentage of the crane’s available capacity. The system also previews the next five radiuses for that given boom angle. Upon selection, Link-Belt Pulse 2.0 will provide a live view of the work area. The 75RT has multiple transport options to accommodate road laws anywhere – it can transport fully equipped at just under 100,000 lbs. (45 359 kg) and under 90,000 lb. (40 823 kg) with removal of 14,500 lbs. (6 577 kg) of counterweight. The 75RT has an overall height of 12 ft. 2.3 in (3.7 m) and can be driven right off a conventional lowboy trailer, assemble counterweight and be ready to go to work! Another new feature of the 75RT is the evolution to a 24-volt electrical system from a 12-volt. The wiring is a Controller Area Network (CAN bus) system, but the increased voltage on the unit yields the ability to multiplex with modules placed near dedicated functions like outrigger beams and winches. 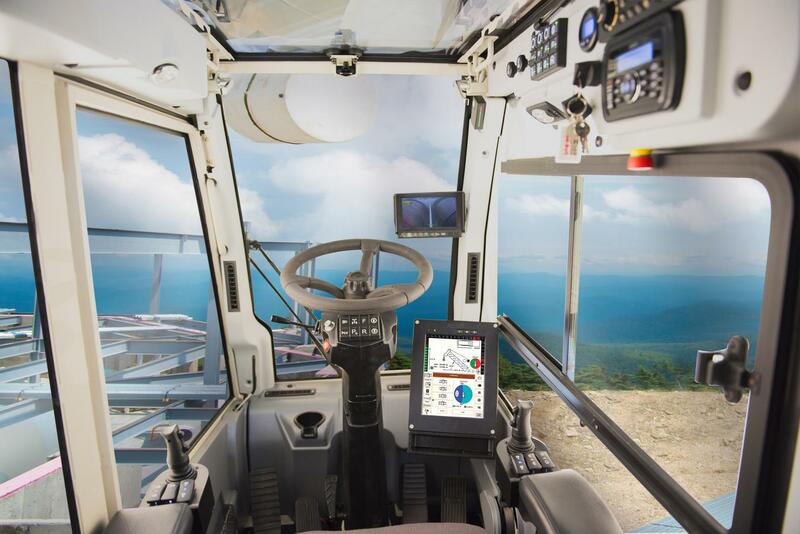 In total, there are five modules located throughout the machine that allow for crane functions to continue working in instances where other modules are being diagnosed or serviced. Once on deck, routine checks on powertrain components and fluid levels are a snap with large swing-out doors and a centralized location for fuse, relays, and breakers. Foldable access ladders and upper guardrails provide reinforced safety boundaries. A centralized pressure check and grease bank located near the cab allows an operator to monitor multiple pressure and fluid workings from one location, eliminating hard to reach grease points. Industry leading telematics in place to give real time data to better forecast maintenance and service needs of the crane that you own. LED viewing lights on all four outrigger beams.